The CFT believes that ultimately we need a single-payer healthcare system, like Canada’s, to solve the problems created in this country by for-profit health insurance corporations. This would put the United States in the company of every other major industrial nation in the world, each of whom spend less per capita on healthcare than we do, while delivering universal access. Based on the Canadian model, single-payer leaves healthcare provision in a mix of public and private hands, just as in the U.S., but cuts out the wasteful health insurance industry, which takes between 25 and 30% of every healthcare dollar spent in the United States for administrative overhead and profit. In Canada, there are no uninsured; everyone has healthcare coverage. Is it a perfect system? There is no such thing. But is far superior by virtually every measure to the deteriorating system controlled by for-profit greed in the U.S. The CFT in 2006 endorsed the first version of State Senator Sheila Kuehl’s SB 840, ”Healthcare for All,” which would have established a single-payer healthcare program in California. In an historic advance, SB 840 passed the State Legislature in late August 2006—the first time a single-payer bill has gotten that far toward law. However, Governor Schwarzenegger vetoed SB 840, proclaiming at the same time he was for universal healthcare, even as he refused to sign the only bill he’s received that would create it. Senator Kuehl reintroduced the bill on February 27, 2007, and CFT reiterated its support at its convention in March. After Senator Kuehl was termed out, State Senator Mark Leno sponsored SB 810 to replace her SB 840 single payer bill. Senator Mark Leno reintroduced the bill as SB 810 in the 2009-2010 legislative session, and again in the 2011-2012 session. In January 2017, while the Congress was trying to repeal the ACA, Californians were lobbying legislators to introduce a new single payer bill to replace the ACA. On February 17, 2017 Senators Ricardo Lara and Toni Atkins introduced SB 562, The Healthy California Act. Unfortunately, that bill did not make it out of the Legislature. 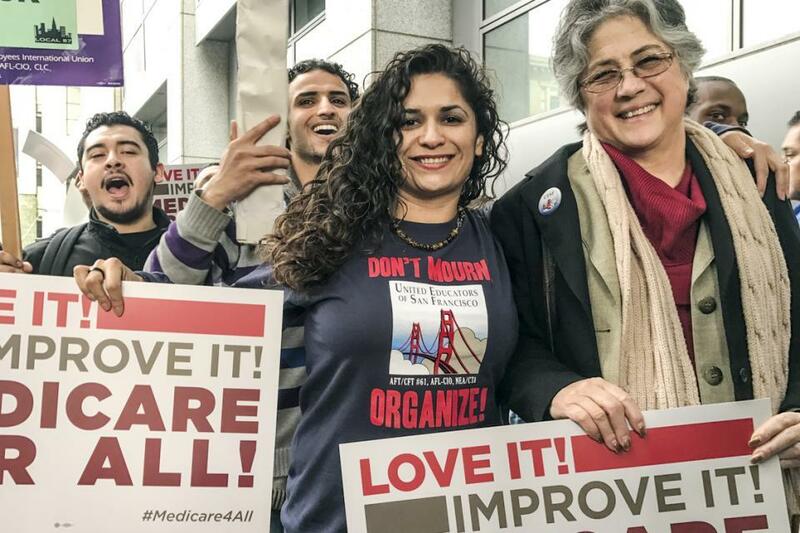 The CFT and other labor groups education labor groups have worked for years together to implement a single payer system in California, to stabilize costs while increasing quality, and to address systemic reasons for high cost and low quality healthcare. A similar effort is underway in the California Healthcare Coalition, a labor-led group which is seeking to make provider services data more transparent and accessible in order to bring greater accountability to treatment and payment. You can be a part of the ongoing effort to achieve affordable healthcare coverage for all. Healthcare should be a right, not a privilege.